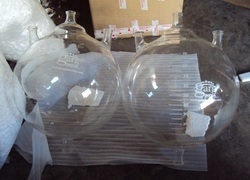 Offering you a complete choice of products which include glass flask receivers, spherical flask and receiver flask. 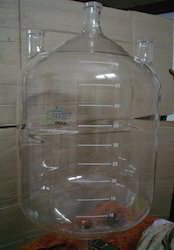 Backed ourselves with sound amenities and talented personnel, we have emerged as one of the leading firms of superior quality of Glass Flask Receivers. The offered flask receivers are manufactured with the help of high grade basic material and modern techniques by our skilled professionals in line with set parameters. Apart from this, provided flask receivers are available in different sizes, lengths and shapes. Along with that, our valued clients can take these flask receivers from us in market leading rates. Generally, the centre nozzle is used for either stirrer fixing or, if stirrer is not fixed, for vapour outlet. The bottom outlet is used for drain. However, in type VSR & VSE, it is also used for fixing immersion heat exchanger. Being a well established-organization, we are engaged in manufacturing, exporting and supplying a distinguished range of Spherical Flask that is broadly used in several chemical industries. The offered flask is manufactured by our experienced professionals using high quality glass and modern techniques as per the set market standards. Our provided flask is checked at various different parameters so as to maintain its quality. We provide our flask in different shapes, capacities and specifications at competitive prices. 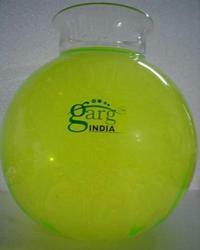 We are dedicatedly engaged in manufacturing and exporting a unique range of Receiver Flasks to our clients. They are supplied with jackets for cooling and heating and are sealed together to prevent high stress by allowing movement between them. Glass jackets are used for maximum operating temperature and maximum operating pressure. Looking for Glass Flask ?